Texas A&M president ends the era of the Dougie? Texas A&M president R. Bowen Loftin attended the Aggies' midnight madness basketball festivities on Friday. And then he hit his Dougie. Texas A&M University When this guy does your dance, it's time for it to go the way of the Macarena. And then the Dougie -- inspired by California Swag District's "Teach Me How to Dougie," it's the latest dance craze among the dance-craze demographic -- right then and there, spontaneously combusted and evaporated into the universe, departing even more quickly than it came. Because when a man that looks like he'd sell popping corn if the academia thing didn't work out is doing your dance, young people, it's time to find something else. Those are the rules. It was one thing with the Oregon Duck did it a couple of weeks ago. But when the folks in Wisconsin held up not-so-clever "teach me how to Bucky" signs at College Gameday, and they were a day behind a physicist born in Hearne, Texas in the '40s? The party is o-vah. Sure, you could look at this as proof of the Dougie's popularity, and maybe you should. When a man so far removed from the hip-hop generation is even aware of a dance, it's come a long way. And that's a good thing because, without all that momentum, there's no way the Dougie could have jumped all the way over the shark. 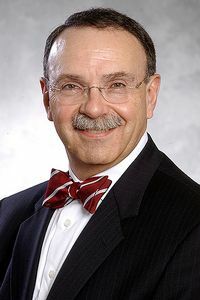 Kudos to Dr. Loftin, who displayed a sense of humor about himself in dancing in front of thousands of college students that most -- read: me -- don't possess. But inadvertently, he may have spelled the end of an era.